I love a planted tank with fish zipping around, which may be evident with my 135 gal tank. I agree with the two above posts. Beauty is in the eye of the beholder. I'll give you an example. I look at a lot of FW aquascaping, the posters have a beautiful scapes. I love the themes and whether it is heavily planted with a few fish, I look at the plants and the way it is set up and am like, "WOW"! I come from the SW side and live rock is not always pretty, at least to folks who are unfamiliar with it, but can look at it and see all the other things that are growing on it an how the setup is "almost" perfect and again say, "WOW"! I do agree some set ups aren't that great, but if you watch and care is taken, the original tank can take on a life of it's own. Remember, some thing take time and I find myself aquascaping my tanks to "mimic" or "invent" my own idea of what I like. I think there should be an adequate amount of both. Personally, I don't think the fish actually care what kind of decor they have, as they will search out their own space. IMO, I do feel that there should always be a place for every fish inhabitant, albeit, a rock, cave, plant, sunroom, beer can or used Volvo. Somewhere they can go to call their own. I liken it to the great "American Fish Dream." Any well thought out tank is eye candy. I have a blackwater tank that is probably one of the nicest tanks I have ever owned. Lighting is somewhat diminished due to the tanins in the water, but it is a looker. I also have a Rift Lake tank that is void of green, just as pleasing to the eye. Biotopic tanks, in my opinion, cannot be rivaled, whether it be all rockwork, blackwater or heavily planted, iwagumi style. It's all eye candy. i must veto on the heavily planted. It really depends on your fish stock as to whether you see them in a "heavily" planted aquarium. Some fish are just naturally shy, while others beg for attention. Also...when you don't see enough of your fish and it bothers you,its time to whip out the snips and do some trimming. I have a moderately-heavy planted 29g tank, and I love seeing the fish disappear into the background and reappear somewhere else as if they were playing hide and seek. For example, I love Rich311k's 36 gallon tank. I'd call it heavily planted. Just in this photo I can see his three angels, a few raspboras, some pristella tetras, and an albino cory. I agree with Black Hills. 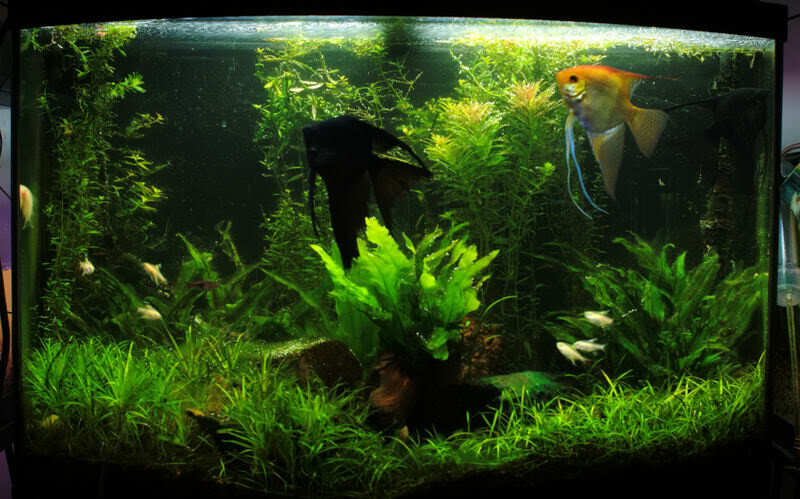 I love the ecosystem approach, using plants and various types of animals, I like to have there be motion in the tank at all times, and a variety of colors and shapes to mix up the picture. I think the fish should be able to hide if they want to, but feel comfortable enough to come out often. The plants are a soft backdrop to the colors of the fish, and really add to the whole environment of a tank. Not to mention the added exitement of watching the plants grow in an underwater garden at the same time.